“Most [players], they kind of tell you who they are,” says Scott Servais, the Angels’ assistant GM of scouting and player development. 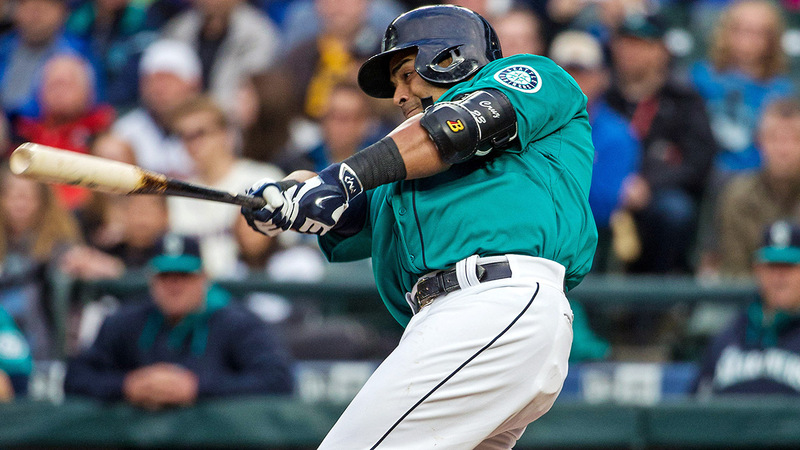 “[Nelson Cruz] is the ultimate exception to the rule.” In Servais’s current role, Cruz is a threat: the big bat in Seattle blocking the Angels’ path to the playoffs, and the best hitter in the American League to this point, with a ridiculous .351/.406/.715 line and an MLB-leading 16 home runs. But in Servais’s former role as the Rangers’ senior director of player development, Cruz was a pet project — one that, at the time, seemed unlikely to pan out. For much of his career, that calculus seemed to exclude Cruz from consideration as a star. Nothing about his background says he belongs among the best hitters in baseball. But he crashed the former top prospects’ party, and now he’s lingering long after we figured he’d leave. And with every swing, he looks less out of place. Cruz was established by Hopkins’s age-29 cutoff, but only barely: He turned 29 halfway through 2009, his first full season in the majors. Technically, that was his age-28 season: The standard cutoff for seasonal age is June 30, and Cruz was born July 1. Any appearance of youth that quirk of the calendar conferred was probably appreciated, because Cruz was behind the curve as soon as he signed with the Mets as an amateur free agent out of the Dominican Republic in 1998 for the small sum of $15,000. “[Cruz] got started late in the game,” says Mariners GM Jack Zduriencik, who signed Cruz to a four-year, $57 million deal in December. “He was a highly touted basketball player, and so he was just one of those kids that took a little while to get the game going. When he originally signed with the Mets, the scout that signed him, Eddy Toledo, used to always keep him out of games when the hierarchy would come down from New York, because he was a talented kid but he was still somewhat on the crude side.” Cruz’s lack of polish persisted well into his pro career. “I remember seeing him in the Midwest League in 2003, and while you could see the physical talent, he had no idea what he was doing in the batter’s box,” says SB Nation prospect analyst John Sickels. Cruz was traded three times before he broke through. The first trade, at the 2000 waiver trade deadline, sent Cruz from New York to Oakland for utilityman Jorge Velandia. Four years later, Cruz’s stock still hadn’t appreciated past utility-bait, and Oakland moved him to Milwaukee as part of a package for Keith Ginter. That’s a depressing sentence just to type, but Cruz alone couldn’t bring back Ginter, who hit .161/.234/.263 for the A’s the following season and never made it back to the big leagues. The other guy Oakland gave up, Justin Lehr, had ranked 20th on Baseball America’s A’s top prospects list entering 2004. Cruz couldn’t crack the top 30. In 2005, his first season with Milwaukee, Cruz posted a combined .289/.385/.537 line across Double-A and Triple-A, which was enough to earn him Milwaukee’s minor league player of the year honors, a brief September call-up, and a jump to eighth on the Brewers’ prospect list the following spring. Cruz was still nowhere near an overall top-100 ranking, but his higher placement may have helped catch the eye of Rangers GM Jon Daniels, who asked that Cruz be included when his team traded Francisco Cordero and complementary players for Carlos Lee at the end of July 2006. In October 2011, then–Baseball Prospectus lead prospect writer and current Astros director of pro scouting Kevin Goldstein previewed that year’s Tigers-Rangers ALCS with “scouting hindsight,” recalling how each player on the postseason roster had been perceived in the minors. Goldstein’s blurb about Cruz said, “Some skills there, but he’s kind of older and on his fourth organization for a reason.” Cruz’s early results with the Rangers reinforced that perception. Cruz had been batting .302 with 20 homers in Triple-A at the time of the trade, but he hit .223/.261/.385 in 41 major league games after reporting to Texas. The pattern continued the following year: Cruz gained and lost an everyday job, hitting only .235/.287/.384 in 333 big league plate appearances despite recording a 2014-esque .352/.428/.698 line in almost 200 Triple-A plate appearances in the same season. At the end of 2007, Cruz was 27 years old, squarely in the physical prime for most players, but had a career .666 OPS in almost 500 plate appearances, half of them accrued in hitter-friendly home parks. The satanic OPS was overkill; Cruz’s MLB experience had been hellish enough. The really perplexing part was how much better Cruz should have hit, particularly in 2006 and 2007, in light of his other-end-of-the-spectrum minor league stats. Cruz’s offensive performance in the majors fell far short of the figures suggested by ESPN analyst Dan Szymborski’s Major League Equivalencies, which use empirical data on all players who switch leagues to estimate what a player’s minor league line would have translated to in the majors. The table below contains the MLEs for each of Cruz’s extended stays at a minor league level from 2004 to 2008. “MLE OPS” is the translation, and “MLB OPS” is the actual result. But the biggest thing, Servais says, was “flattening out his swing so he could catch up to the plus fastballs at the big league level. When they got elevated, he was always underneath the ball. This helped him get flat through the ball, and that’s where his power had a chance to play.” Before the changes, Cruz “was more or less crashing with the ball in a sense, trying to run into it,” Jaramillo says. But Cruz was strong enough that he didn’t need to have Charlie Brown’s swing path to power the ball. He just needed to make contact. Since 1950, only 17 players have had their first 500-plate-appearance season at age 28 or later, like Cruz, and hit as well as he did in that first full-time year and the following five years, as measured by Baseball Prospectus’s Batting Runs Above Average. Most of the players ahead of him fit into understandable boxes. Some were catchers (Jorge Posada; Mickey Tettleton; Chris Hoiles; Darren Daulton) who often break in late because of their position’s greater defensive demands. Some were injury-prone (J.D. Drew) and underappreciated or mismanaged (Jose Cruz, Ben Oglivie). Some were international free agents (Hideki Matsui) or players who missed time because of military service (Jim Lemon). Some were mid-’90s Indians who were blocked by bigger stars (Brian Giles,2 Jeromy Burnitz). Not many took so long because they flopped as convincingly as Cruz did in his first couple of cracks. The best recent comp might be Ben Zobrist, a better overall player than Cruz who has some things in common with him: Zobrist hit well in the minors but experienced the same early major league stumbles that seemed to vanish following a swing change. Cruz had a .230 True Average over 477 PA in his first three partial seasons; Zobrist had a .228 True Average over 530 PA in his. Since 1950, 48 players have finished their third MLB season (of any length) with a True Average of .240 or worse and gone on to accrue at least 3,000 PA. As one would expect, it’s an uninspiring group. Cruz’s career stats haven’t yet been dragged down by a decline phase, but for now he leads the list. As Servais says, he’s an exception. Despite Cruz’s belated success in Texas and Baltimore, the deal Seattle gave him was widely panned, more for the fourth year that will keep him under contract past his 38th birthday than for the money needed to secure the short-term upgrade he was bound to provide at one of the Mariners’ perennial soft spots. “He won’t hit 40 homers again, obviously, and I’ll go out on a limb and say he won’t again reach 30,” Blengino wrote in a well-reasoned post that seems overly pessimistic in hindsight. Thus far, though, Cruz has propped up the Mariners, producing 25.3 percent of the team’s total Weighted Runs Created.3 No other player has accounted for as large a portion of his team’s production in 2015, which reflects well on Cruz and poorly on most other Mariners ([cough] Robinson Cano [cough]). For a few years early this decade, Safeco Field was one of the hardest places for right-handers to hit home runs, but it’s played closer to neutral over the past two seasons following left-field fence adjustments. Park factors might not apply to Cruz the way they would to a typical player: As Adam Jones said before Tuesday’s game, in which Cruz returned to Baltimore and drove in three of Seattle’s four runs with a fly ball over the left-center-field fence, “Put him in the Grand Canyon and he’d hit it out of there, too.” Of 136 players who’ve hit at least 15 fly balls for which we have distances recorded by Statcast, only Bryce Harper and Chris Davis have topped Cruz’s average of 355.3 feet. Thanks to Rob McQuown for research assistance. The other two: Hank Sauer and Cy Williams. Giles’s six-season BRAA total dwarfs all of the other late bloomers’: The gap between him and the second-ranked Drew is bigger than the gap between Drew and no. 34 Shane Mack. In that period from 1999 to 2004, Giles was the 10th-best hitter in baseball. Last year, Freddie Freeman led all players in personal wRC share, generating 19 percent of the runs produced by the moribund Braves. Luckily for Servais, the Angels are almost the only team that Cruz hasn’t crushed.